Our Place targets personal growth through skills development and immersion in community life so that participants can be full members of their community. We do this by focusing on the skills needed for successful social interactions in all aspects of a full life. Our participants learn and practice these skills at work, with each other in social settings, with typical peers and community members, in classes and clubs, with service projects that improve the community and in recreational activities. We help participants develop intensive relationships with staff, peers, mentors and community volunteers; we have found this to be the most effective way to attain personal objectives. Activities address the components of a rich life: work, socializing, volunteer service and lifelong learning. We provide direct service nine hours every weekday and three hours on Saturday evenings. Participants choose from 40 distinct programs to meet their personal goals and interests in the areas of vocational, life, and social skills, as well as enrichment and recreation. Over 70% of programs occur in community settings. In each of the last five years, over 80 percent of participants showed improvement in social skills. Eighty-five percent of families reported improvement in the social skills of their participants outside of program hours. One hundred percent of families express satisfaction with programs. More than 100 community volunteers provide peer mentoring and personal assistance. Because social skills form the basis for meaningful relationships, successful employment and community inclusion, we design all of our programs around the goal of developing and improving social competencies. We coach participants in making and sustaining friendships, carrying on a conversation, learning to share and take turns, working as a team and cooperating with others in the group. We integrate typical teens, young adults and community volunteers as mentors to model appropriate social behaviors and build friendships with participants. Arts Programs at Our Place provide experiences in literary, visual and performing arts across a wide variety of activities. Participants learn to use the creative process to enhance physical, cognitive and emotional well-being. Activities include Barry Siegel’s heARTwords which is a creative expression, writing and discussion group, drum circle, art classes in a variety of media, art therapy, AMASE choir at Northwestern, talent shows and trips to plays, museums, concerts and cultural events. Our vocational programs develop job skills, key skills and the “soft” skills required for successful employment. We provide hands-on experience at work sites in a variety of jobs at the local food pantry, the public library, a senior residential facility and a charity thrift store. We also work on key skills such as problem solving, following and giving directions, communicating information and requesting or offering assistance. We target “soft” skills so that participants display appropriate workplace behavior, discuss appropriate topics, know when to socialize on the job and learn appropriate interaction with coworkers. Our Healthy Living Initiative provides instruction and hands-on training in healthy food choices and exercise on a daily basis. Participants plan menus, shop and prepare daily lunches and snacks. They practice kitchen skills while preparing lunch for the whole group and staff in Top Chef. Guest celebrities visit to assist in meal preparation. Participants research and select healthy options from area restaurants for community lunch outings and visits to local coffee shops. They exercise, work with trainers, play team sports and walk at park district fitness centers. They swim at the YMCA and take ballroom dance, Zumba and yoga classes. Our Life Skills programs teach daily living skills so that participants can manage the basics of life independently. We focus on the tasks associated with cooking, housekeeping, laundry and safety. We practice meal planning, budgeting, grocery shopping, safe food handling and meal preparation. We sort clothes, do laundry and fold clothes. Participants clean, dust, vacuum, mop and straighten the common areas of Our Place and learn how to clean the kitchen, take out the garbage and recycle. We also practice safely moving through the community, riding in cars and on public transportation and using cell phones. Relaxing and hanging out with friends is also important in creating a full life. 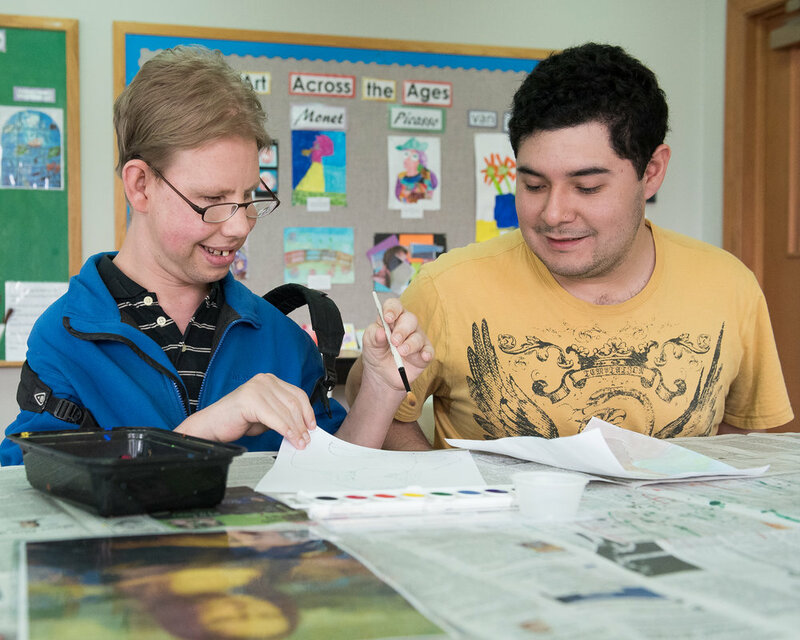 Our Place participants pursue many interests as they build confidence, team spirit and skills. Recreation programs include bowling, basketball, kickball, floor hockey, fantasy sports, Zumba, ballroom dance, book club, wii, happy hour and community outings. Our service programs provide participants with many opportunities to contribute to our community and to build community connections. We volunteer close to 8,000 hours per year at area agencies including the local food pantry, public library, senior residential community and thrift shop. We build strong, reciprocal relationships with our service partners which have led to employment for participants, increased involvement of community volunteers and special recognition in the community. We give back to our community with projects that clean up the parks, adopt families at the holidays and help other nonprofit agencies fulfill mailings and outreach. Every week Our Place participants gather for a Saturday Social. It’s all about having fun with friends, peers and staff. The evening starts with socializing and moves on to pizza, dancing, games and dessert. Socials have been the start of many beautiful relationships. We organize our schedule to provide maximum flexibility and choices to meet your needs. Every week Our Place participants gather for a Saturday Social. It’s all about having fun with friends, peers and staff. The evening starts with socializing and moves on to pizza, dancing, games and dessert. If you are interested in learning more about Our Place, please contact us at info@ourplaceofnewtrier.org. We take small steps through the application process, starting with an in-depth telephone interview. The next steps include a tour, written application and in-person interview. This is an important decision for you and for us. We make every effort to ensure that your son or daughter will benefit from our programs.